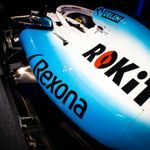 “A lot of people are aware that Williams’ tradition colours are navy blue and white, but I wanted to move away from that and show the world that we’re a fresh, revitalised brand. A meagre seven points and last place in the Constructors’ Championship made 2018 a year to quickly forget for the former multiple champions, with Williams admitting it was “soul-destroying” heading to races with little chance of scoring points. “We’ve lost pretty much nobody from our race team this winter and I think that shows the strength of spirit that we have within Williams – and everyone’s dedication to getting it back [on track],” she said. While steering clear of setting specific targets, Williams says it is clear the team must move forward. “We never say our target is to be X, Y or Z, that’s dangerous,” she added.